This cake is, quite simply, a showstopper. 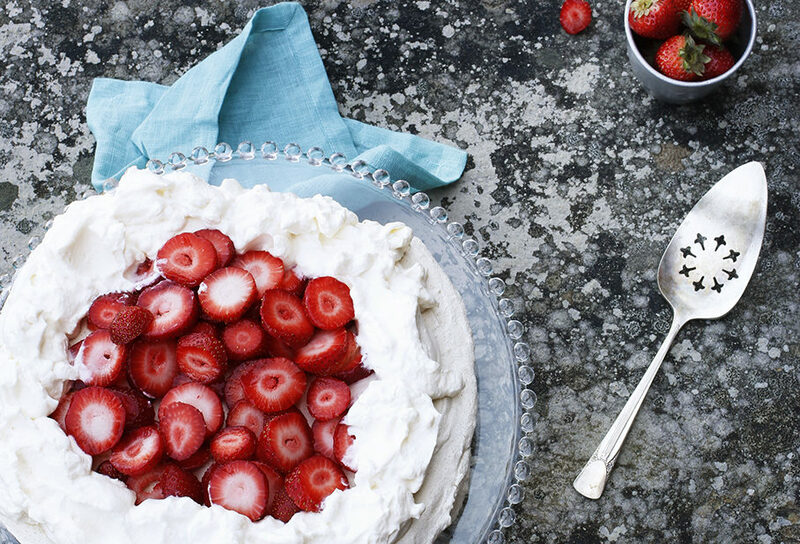 With mounds of fresh strawberries layered between billows of whipped cream and disks of slightly chew almond meringue, it tastes as fabulous as it looks. Preheat the oven to 350ºF. Place the almonds on a baking sheet and toast until just golden, 6 to 8 minutes. Lower the heat to 250ºF. Transfer the almonds to the bowl of a food processor. Add ½ cup of the sugar and pulse until the almonds are finely ground. Place the egg whites in the bowl of a stand mixer and beat on high speed until foamy. Add the salt and gradually beat in 1 cup of the sugar until stiff peaks form. Continue beating on the highest speed until you have a stiff, shiny meringue for about 3 minutes. Gently fold in the almond mixture. Line a large baking sheet with parchment paper. With a spatula, carefully spread the meringue into two 8-inch rounds, smoothing the tops. Bake until pale gold, about 1 hour. Then turn off the heat and prop the oven door ajar with the handle of a wooden spoon. Let the meringues dry in the oven for 2 hours more, until no longer sticky to the touch. When the meringue layers are ready, whip the cream with the remaining 2 tablespoons of sugar and the vanilla until stiff but not dry. Carefully transfer one meringue layer to a cake plate. Spread ½ cup of the whipped cream over the layer and top the cream with half of the strawberries. 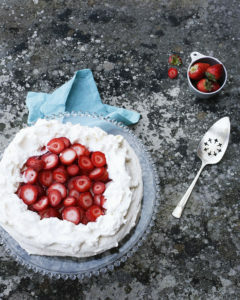 Cover the strawberries with another ½ cup of the whipped cream. Place the second meringue layer on top of the filling. Decoratively pipe the remaining ½ cup whipped cream around the edge of the meringue layer, and fill the center with the remaining sliced strawberries. Place the cake in the refrigerator to chill for 1 hour before serving to allow the flavors to meld. It can be held up to 4 hours before it begins to weep. Let it stand at room temperature for 15 minutes before serving.